Marine Le Pen’s National Front (FN) is seeking to consolidate its last week’s gains in France’s second round of regional elections. The far-right FN is leading in six of 13 regions in mainland France. However, opinion polls indicate that the centre-right Republican opposition of Nicolas Sarkozy has gained ground since then. The Republicans pushed the ruling Socialists into third place in the first round. The Socialists have removed losing candidates from vulnerable seats to avoid splitting the anti-FN vote. However, the Republicans have refused to do the same. The FN won 27.73% of the vote in the first round, followed by Nicolas Sarkozy’s Republicans on 26.65% and President Francois Hollande’s Socialists with 23.12%. Marine Le Pen, who stood in the northern region of Nord-Pas-de-Calais-Picardie, and her niece Marion Marechal-Le Pen, who stood in Provence-Alpes-Cote d’Azur in the south, both looked to have won more than 40% of the vote. She later told her supporters it was a “magnificent result” which proved the FN was “without contest the first party of France”. The far right has been steadily gaining votes over the past few years from both left- and right-wing sympathizers through a mix of nationalist and pro-welfare policies, correspondents say. 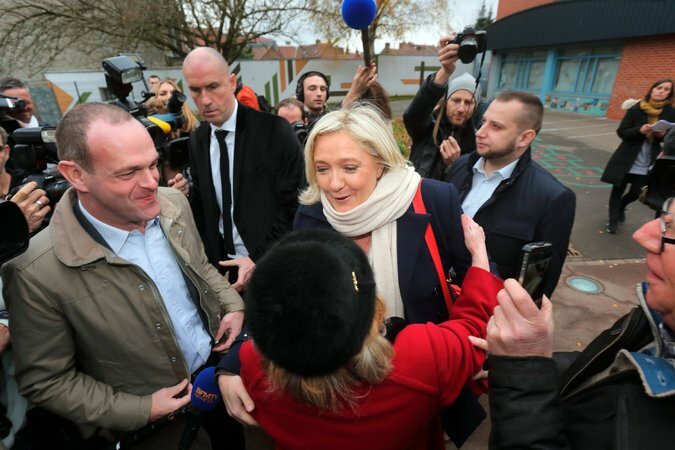 In the lead-up to the first round, opinion polls suggested that the popularity of the anti-immigration, anti-EU FN had increased since the deadly attacks in Paris on November 13. The FN is hoping a strong performance will boost Marine Le Pen’s chances in the 2017 presidential election. The government’s response to the Paris attacks has boosted President Francois Hollande’s approval ratings – they have soared more than 30 percentage points to 50%. However, this surge in personal popularity has so far not translated into greater approval for Francois Hollande’s Socialist Party.